A fractal is generally 'a rough or fragmented geometric shape that can be split into parts, each of which is (at least approximately) a reduced-size copy of the whole,' a property called self-similarity. The term was coined by Benoît Mandelbrot in 1975 and was derived from the Latin fractus meaning 'broken' or 'fractured.' Because they appear similar at all levels of magnification, fractals are often considered to be infinitely complex. Natural objects that approximate fractals to a degree include clouds, mountain ranges, lightning bolts, coastlines, and snow flakes. 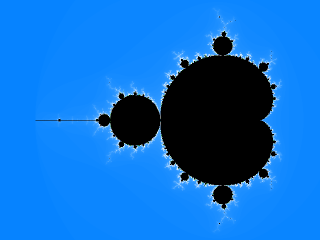 The Mandelbrot set is a famous example of a fractal. 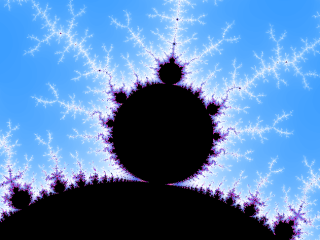 A closer view of the Mandelbrot set. where z and c are complex numbers: z = x + iy, z0 = 0, and c is a point on the plain. The formula is iterated until |zn| (the magnitude of z) is greater than or equal to the bailout value 2. Then the pixel that c corresponds to is colored according to the number of iterations that occured before the process bailed out. The uninteresting black area of the image is the actual Mandelbrot set. It consists of all the values for c where |zn| never got larger than 2. Of course this area is impossible to calculate accurately, so the program colors black all pixels for which |zn| never gets larger than 2 for a given number of iterations, for example 256. 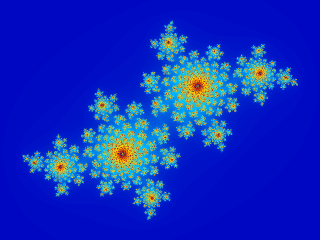 One of the most basic fractal types is the family of Julia sets, discovered by the French mathematician Gaston Julia during the first World War. Julia sets are created by a simple formula with one complex parameter called C or seed. This parameter can be varied to create many variations. Julia sets are also self-similar. 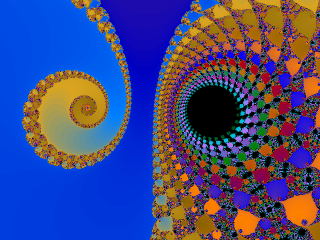 Julia set for C = [-0.4, 0.6]. Where a is any complex number and p'(z) is the derivative of p(z).The special choice a = 1 corresponds to the Newton fractal. This fractal applies the formula to each point on the complex plain, and colours it according to how many iterations are required for p(z) to converge (approximately) to zero. The boring regions of the fractal are actually solutions of the origional equation. Now that you know a bit more about fractals, you are probably wondering how to produce these with Utimate Fractal. 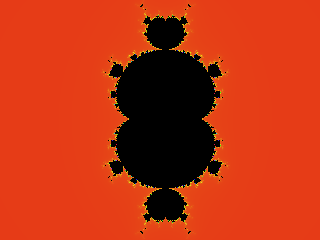 By default, Utimate Fractal opens with a standard Mandelbrot fractal, so the easiest way is to take this fractal and start zooming. Click and drag inside the fractal window to zoom in. Click the right mouse button to zoom out. Ultimate Fractal has many more possibilities, but it is a good idea to start with simple zooming to get a feeling for what fractals are and how Utimate Fractal works. Click and drag inside the fractal window to zoom in. The magnified portion of the fractal. 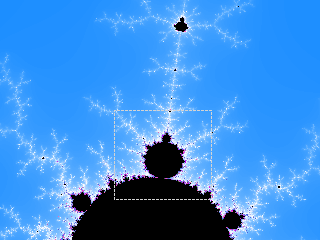 The Fractal Parameters Window shows the display center, the maximum number of iterations, the magnification or scale, the complex parameter C used in the Julia set, and the value of the parameter a used in the Newton set. You can change these parameters and press F5 (Refresh) or click the Refresh button. X The X value of the display center. Values can range from -2 to 2. Y The Y value of the display center. Values can range from -2 to 2. Iterations The maximum number of iterations in the calculation of the fractal. Values can range from 1 to 10000. If the maximum iteration count is too small, the pixel will be incorrectly colored (black). On the other hand, if the iteration count is too large, many iterations will be performed and the fractal will be calculated slowly. Scale The magnification. A magnification of 200 times displays the entire fractal. X (Julia) The X value of complex parameter C used in the Julia set. Y (Julia) The Y value of the complex parameter C used in the Julia set. a (Newton) The value of the parameter a used in the Newton set. The Fractal Parameters Window shows the display center, the maximum number of iterations, the magnification or scale, the complex parameter C used in the Julia set, and the value of the parameter a used in the Newton set. Click and hold your left mouse button and drag inside the fractal window to zoom in. Click the right mouse button to zoom out. To reposition the fractal, click the left mouse button to select a point in the fractal. This point will become the new center in the fractal window. 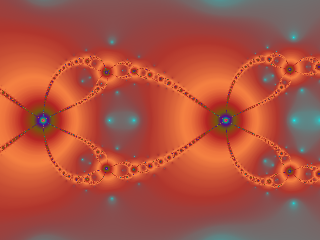 The Zoom In command (F9) allows you to zoom in on the fractal. 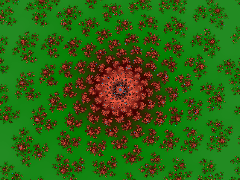 The Zoom Out command (F10) allows you to zoom out on the fractal. Gradient The pixels in the fractal are colored according to the caculated index value in a linear gradient. Gradient 3D 3D effect added to the Gradient style. Hue Variation The Hue component of the pixel is changed according to the caculated index value. Hue Variation 3D 3D effect added to the Hue Variation style. 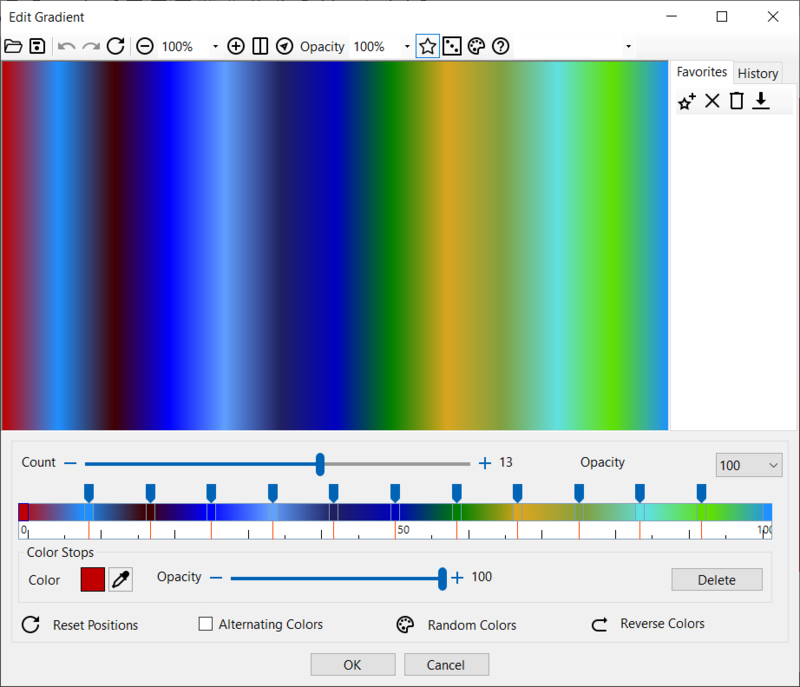 The Randomize Colors command (F6) allows you to generate random colors. The Edit Gradient command allows you to edit and change the gradient. The Open Gradient command opens a gradient (not the other parameters) of a previously saved parameter file (*.fractal). The Gradient dialog allows you to modify the gradient. Change the colors by clicking one of the colors. Drag the position sliders to change the positions of the interpolation colors. The color positions in the control specify percentages of distance along the gradient line. For example, a value of 20 specifies that this point is 20 percent of the total distance from the starting point. The positions in this control are represented by values between 0 and 100, and the first color in the gradient must be at position 0 and the last must be at position 100. Check Alternating Colors to use two alternating colors. When Ultimate Fractal calculates a fractal, it does not immediately calculate a color for each pixel. Instead, it calculates an intermediate index value . A gradient translates index values to colors. Since only the index values are stored, the colors and color style can be changed without having to recalculate the fractal. Here is an example of the same fractal for three different gradients. The Open command (Ctrl + O) opens a previously saved parameter file (*.fractal). The Save Parameters command (Ctrl + S) saves the fractal parameters. A fractal file contains a single fractal and all the information required to restore it. The calculated pixels are not saved. Use the Save Image command to save the fractal in image format. The Save Image command saves the fractal in image format (BMP, JPG, GIF, PNG, TIF). The Image Size dialog. Choose the image size or a predefined image size and the image resolution (default 180 dpi). The Page Setup command allows you to set page details for printing in Windows applications. The Print command (Ctrl + P) allows you to print the fractal. The Print Preview command allows you to preview the appearance of a printed fractal. The Recent Files command allows you to open a fractal from the recent files list. The Exit command (Ctrl + Q) allows you to close the program. The Undo command (Ctrl + Z) allows you to undo your last action. The Redo command (Ctrl + Y) allows you to redo your previous action. 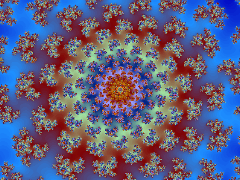 The Copy command (Ctrl + C) allows you to copy a picture of the fractal to the clipboard. 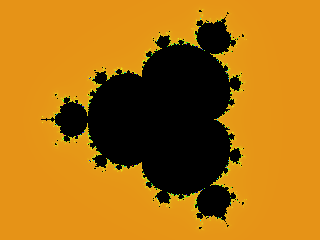 The Reset command (Ctrl + R) allows you to restore the default Mandelbrot and Julia parameters. The Refresh command (F5) allows you to refresh the fractal. The Predefined Gradients command allows you to choose a predefined gradient. The Add to Favorites command (Ctrl + F) adds the fractal parameters (not the color style or gradient colors) to your Favorites list. The Organize Favorites command allows you to delete fractals from your Favorites list. The Favorites list gives you a convenient way to organize and access frequently used fractal parameters. Like bookmarks in a web browser, the Favorites list helps you quickly access frequently-used items. With your fractals on the Favorites list, you can open them without browsing the file system. When you open an item only the fractal parameters are loaded, not the color information. Use the File Open command to open the fractal parameters including color information. The Favorites folder is located in the application directory (C:\Program Files\Pop Art Studio\Fractals). The Help command (F1) allows you to show the help. The Language command allows you to change the language. The Order command allows you to order the program online. The Enter Registration Key command allows you to enter your registration key and unlock the program. The About Ultimate Fractal command allows you to show the version, version history, website and contact email address.